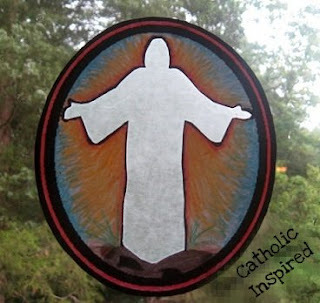 This is an INSTANT DOWNLOAD to create a simple activity is for celebrating the Transfiguration of Jesus. This "sun-catcher" is meant to resemble the gleaming white light that Jesus shown on the mountain during His transfiguration. Print the image of Jesus onto stock/heavy paper. Color the background behind Jesus. It can be as simple as rays of light to as detailed as a mountain scene with clouds. Now cut out the circle and the Jesus shape. Tape wax paper to the back so the light can shine through Jesus. Use string, tape or tack putty to hang it on a window or a light/lamp. Kids love shining a flashlights through it too!! To make it "gift quality" or sturdy enough for younger children to play with, you could laminate it or put it in contact paper.